One of the benefits of homeschooling is the ability to develop close relationships between parents and children as well as between siblings. When children are in a school setting, relationships with teachers and friends compete with loyalty to parents and siblings. School schedules and homework assignments take priority over family time, and children may be taught values that conflict with those taught in their homes. Having attended public school as a child and teen, this definitely describes my school years. When families homeschool, they operate as a team. Parents are confidants; and siblings are close friends. Schedules are set according to the family’s needs, and children are taught their parents’ values. This is very true for the way I’ve set up homeschooling for the girls. At home, the curriculum and activities meet the needs of each daughter – not the needs of a classroom or school system. Both girls are treated as individuals, and are truly known and loved. I’m able to customize their lessons based on their interests as well as their developmental abilities/skills. The curriculum and schedule is flexible so if something isn’t working, I can modify it to better fit their needs. The goal is to make learning fun and educational…and inspire a love for learning. 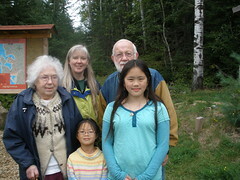 Another benefit of homeschooling is that the girls have been able to develop a closer relationship with their grandparents who live 50 miles away. on their First Communion Day. She chose to read him his favorite book when he was a child. 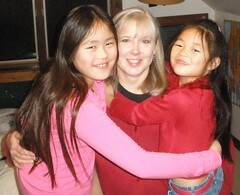 Another benefit to homeschooling is that children within a family have stronger relationships. There is generally more camaraderie than in siblings who attend school. Since Sophia and Olivia are each other’s primary playmates, deep relationships have been and will continue to be formed and nurtured. 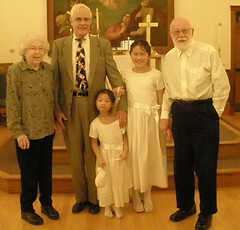 with their grandparents and me. 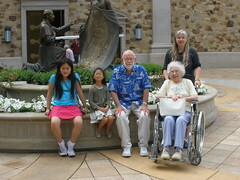 (a place where the girls’ grandparents wanted to visit). As Sophia’s and Olivia’s teacher, we spend a lot of time together in two main ways – educationally and as a family. This time that we spend together learning, working through any problems, and communicating keeps us all well aware of one another. An educational trip to northern Minnesota. my Dad/Papa took many trips during the 1960s and 1970s. Good relationships and communication extends beyond the immediate family. 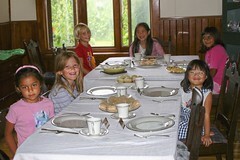 Generally, homeschooled children can easily communicate with people of many ages and from different walks of life. They learn to adjust to the group to whom they are speaking. Because of this, they often comes across as thoughtful and mature. 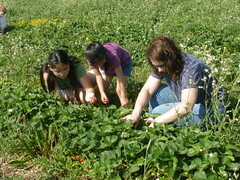 The girls picking strawberries with their aunt. family friend (Alice) and her dog (Maggie). Gathering together as an extended family brings together people of all ages – from newborns to seniors – giving the girls opportunities to play, talk, and build relationships with others. An opportunity for playing, talking, and having fun together. Homeschooling has given the girls opportunities to form friendships with people of different ages who live in other countries. They have met and hosted people at our home including two exchange students from Brazil who lived here in the late 1990s; and my friend from Japan who visited here a couple years ago. 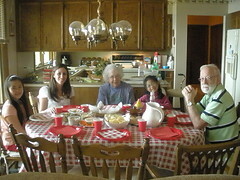 The girls with Ruth (from Brazil) and their grandparents. The girls also have enjoyed making friends with other homeschoolers as well as children who attend public, private, parochial, and charter schools. 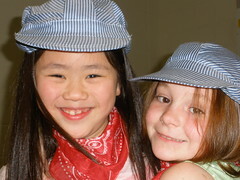 This have given them insight into multiple ways that children learn, and introduces them to a wide variety of children. 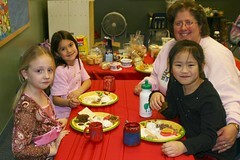 The girls having a tea party with some of their friends. 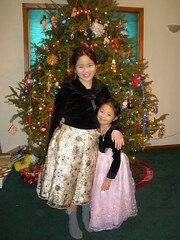 Sophia and a friend before one of the choir performances. They have participated in community activities – theater, community ed courses, camps, homeschool swimming lessons, choir, and sports – which introduces them to a diversity of children who have a wide variety of interests. play/musical with her at a local community theater. The girls also have had the opportunity to learn from other adults – whether it is at the homeschool co-op where they take a variety of classes; or through special education/speech therapy. They have developed special friendships with some of the teachers and therapists who have helped them learn and gain new skills. 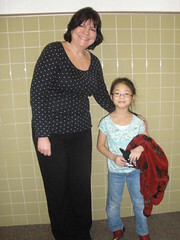 Sophia with one of her teachers at the homeschool co-op. Olivia with her speech therapist, Laurie. 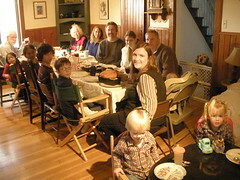 Homeschooling is represented by strong and varied relationships. As the girls get older, this will continue to be an important area and benefit to homeschooling. For over four years, Sophia and Olivia have been learning how to quilt. They started hand-sewing a bit before machine-sewing to get comfortable with a thread, needle, and fabric. 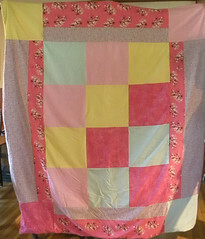 One of the first projects that the girls did was a simple patchwork quilt. They picked fabric from what I had on hand (a lesson in itself of resourcefulness and making do). For some of their first sewing projects, they traced squares onto the back/wrong side of the fabric and then cut them out. They moved onto measuring and marking lines on the fabric. 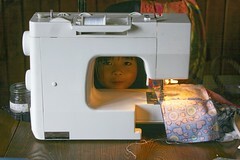 Sophia now can use a rotary cutter to cut fabric. Olivia arranging squares for her first patchwork quilt. She’s about 4 years old here (2007). 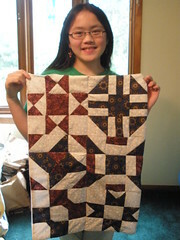 One of Olivia’s favorite quilts that she made was one using fabric she found at a quilting store in Pella, Iowa. The girls, my parents, and I traveled to Pella in the spring to see the tulips. There was a wonderful quilting store right off the main square. Olivia liked a printed fabric with dogs on it. From that pattern, she picked several other fabrics to coordinate with it. She cut, arranged, and sewed all the pieces together to create her quilt. Olivia made this quilt using fabric she found at a quilt shop on a trip. This quilt holds special meaning and memories for her. She was 6 years old when she made this quilt (2009). 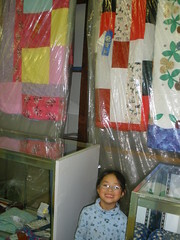 Olivia entered her quilt in the county fair in the youth open class division. She was competing with children up to the age of 16 years old in her category. She won first prize… a blue ribbon (there are only 6 ribbons – 1st through 6th place – awarded in a category). Needless to say, she was thrilled! that won her a blue ribbon! For 2010, at 7 years old, she wanted to challenge herself to do something different. She looked with me at pictures of quilts on Flickr and saw one that she liked. It was a circular quilt made from a variety of fabrics. The quilt she saw was done in rainbow colors with a white center. Olivia wanted to do hers in all blue fabrics with a white center. Since there was no pattern, we had to create a pattern for the blue pieces and center white piece. Olivia chose a variety of textures also for the blue pieces which posed a bit of a challenge since each had a different “pull” to it. She had to try sewing different types of fabric together which was a good skill to learn. Another skill she learned was doing free-style quilting. On the white fabric, she moved her presser foot around in a random pattern to secure the top, batting, and backing together. Olivia working on her blue and white circular quilt. She’s doing some free-motion quilting to secure the top, batting, and backing together. 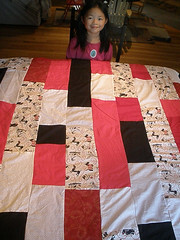 Olivia was 7 years old when she did this quilt (2010). Sophia started making quilts in 2006 (when she was 5 years old) and did a simple doll-size patchwork quilt from a kit she received for Christmas. The nice thing about the kit was that the squares were already cut for her. She simply had to sew them together and then create the quilt. Once she learned how to do that she wanted to create another quilt using fabric that she picked out from what I had on hand. She used the same method as I used with Olivia (tracing of the shape on the fabric and then cutting it out). 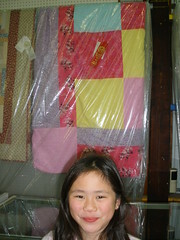 By 2008, she was enjoying quilting so her grandma gave her a quilting kit in her favorite color: pink. 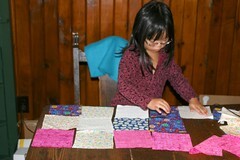 The kit came with the fabric and pattern, but Sophia had to cut each piece for the quilt. 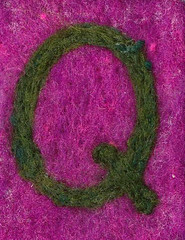 The fabric was a variety of textures – cotton, satin, and minky. It was delightful to feel (from a sensory perspective). In terms of sewing…a bit more challenging, especially for a beginner quilter. She patiently worked on the quilt and was so pleased with how it turned out. She used the quilt and enjoyed how it felt with the different textures. 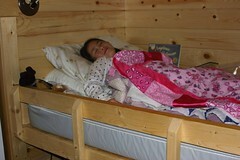 Sophia in a bunk bed in a camper cabin. She wanted to bring her quilt on her first camping trip. Sophia was 7 in this picture (2008). 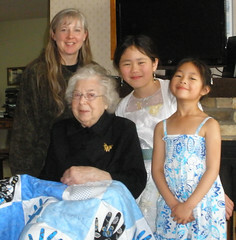 By the following year, Sophia set a goal of making a quilt for her bed. She wanted a quilt in colors that she liked. We checked out some books from the library and she found a pattern that she liked. After a visit to the fabric store, she was ready to start making her quilt. Sophia placed the pieces for her quilt on the floor. She would pin the pieces she needed to sew as she went along. Sophia is 8 years old in this picture (2009). She was happy with how her quilt turned out; and has used it on her bed since she made it. Sophia holding her finished quilt. She entered the quilt in county fair and received a red ribbon on it (second place). At 8 years old, she was in the category with children up to 16 years old. Sophia by her quilt at the county fair. She was 8 years old. When Sophia was 9 years old, she tried a different form of quilting. Her grandma gave her a pre-printed image on fabric. 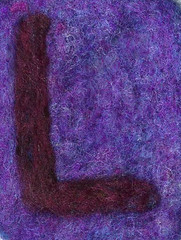 Sophia quilted around different parts of it to give it texture and definition. She added sequins and beads to embellish it, and then finished off the quilt. 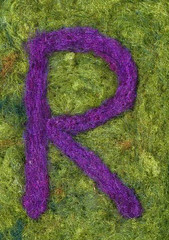 She entered it into the county fair for one of her 4-H needlework projects. In 4-H, the children talk with a judge who asks them questions about their project and determines how much they understand about their project area. Sophia received a blue ribbon for her project which made her happy. Sophia meeting with a 4-H judge to discuss her project. 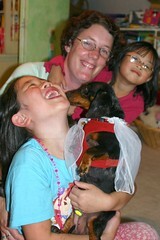 During the 2010-2011 homeschool year, Sophia took a sewing class at the homeschool co-op. One of the projects she worked on was learning quilting patterns. During the spring, she learned six new patterns. She chose to sew the squares together to make a little lap or doll quilt. shows six new patterns that she learned. She’s 10 years old (2011). 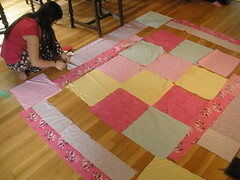 Quilting has been an important part of homeschooling for the girls. In addition to art/creative expression, quilting helps with math and reading. I’ve also integrated geography and history when doing some of the quilts. With a back-to-homeschool trip to New England in September to celebrate the start of a multi-year/multi-disciplinary geography study, the girls are excited to visit a quilt shop in New Hampshire that has over 5,000 bolts of fabric. They each want to pick some fabric so they can make a quilt when they return home. Having a tangible reminder of this special time together is something that I hope they look back on with good memories in years to come. Olivia at 4 years old working on her first quilt. For the 30th book that I read this year as part of the 52 Books in 52 Weeks challenge, I chose Golden Sun by Ruth Sanderson. This is actually a youth fiction book that I read to Olivia, but it fits the goals of the challenge (e.g., over 100 pages, has a plot). The book is the fifth one in the Horse Diaries series, and is a wonderful story that combines history, Native American life, and horses. 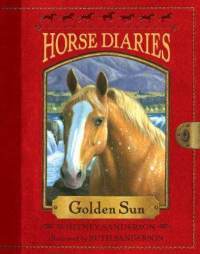 Much like how the book Black Beauty is narrated by Black Beauty (the horse) himself, Golden Sun is written in a conversational tone and told from the perspective of the horse (also named Golden Sun). Golden Sun is a chestnut snowflake Appaloosa. During the summer, he treks through the mountains with his rider, a Nez Perce boy named Little Turtle who collects healing plants. He accompanies Little Turtle on his Vision Quest where both realize their true calling. Golden Sun intersperses words used by the Nez Perce which Olivia and I knew because we had read the Kaya books (an American Girl series about a Nez Perce girl). The Kaya books had a translation/dictionary in the back to explain what the Nez Perce words meant which was helpful. Having read that series first, we had a greater appreciation and understanding of Golden Sun. Golden Sun has realistic, beautiful illustrations by Ruth Sanderson. Her ability to capture the detail and beauty of horses is consistent throughout the entire Horse Diaries series. There is a sixth book in the series that will be released (hopefully) soon. Both Olivia and Sophia are looking forward to reading it. For the 29th book that I’m reading this year as part of the 52 Books in 52 Weeks challenge, I chose When We Were Friends by Elizabeth Joy Arnold. I just started reading the book on Friday, and can tell it is a book that I’m going to like it. The writing style is easy to read, and the characters are well-developed and seem like “everyday” people – they could be one’s friends, neighbors, or colleagues. Lainey Carson and Sydney Beaumont were the closest of friends — until they reached high school and Sydney’s burgeoning popularity made it easy for her to leave the contemplative, ungainly Lainey behind. Eighteen years later, Lainey, who lives at home caring for her mother, is an artist who’s never found the courage to live her dreams. When Sydney shows up on her doorstep with her infant daughter, insisting that Lainey is the only friend she can trust, Lainey reluctantly agrees to take temporary custody of the baby to protect her from an abusive father. But that very night, Sydney appears on the evening news — claiming that her daughter has been kidnapped. Unsure of whom she can trust, Lainey is forced to go on the run with a child who is not her own — but whose bond with her grows stronger every day they spend together. In search of a safe place to stay, Lainey befriends a man who, concerned for their welfare, offers them a home. But as the two grow closer she starts to realize that he may be harboring his own secrets. An utterly riveting story that will keep you turning the pages, When We Were Friends asks how we define motherhood and family, whether we ever truly overcome our pasts, and what friendship really means. From some of the reviews I read about the book, the plot is unrealistic and a bit far-fetched. However, if you know that going in you can adjust your expectations. For the most part, the reviews of this book are positive and it comes highly recommended. 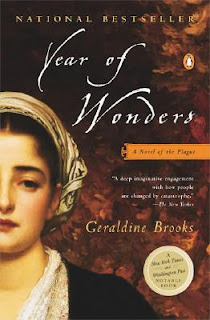 This week, as part of the 52 Books in 52 Weeks challenge, I’m reading Year of Wonders by Geraldine Brooks. When an infected bolt of cloth carries plague from London to an isolated mountain village, a housemaid named Anna Frith emerges as an unlikely heroine and healer. Through Anna’s eyes we follow the story of the plague year, 1666, as her fellow villagers make an extraordinary choice: convinced by a visionary young minister they elect to quarantine themselves within the village boundaries to arrest the spread of the disease. I began reading this book and didn’t want to put it down 38 pages later. Picked it up again in the evening and reluctantly put it down at 65 pages. The author writes with great regard for period detail, and uses elegant prose. Inspired by the actual remote British village (Eyam) commemorated as Plague Village because of the events that transpired there in 1665-1666, the author tells this story from the perspective of 18-year-old Anna Frith. Ann was widowed by the mining accident that took her husband’s life. After her husband’s sudden death, she is unable to work the mining claim that had provided a decent living for her family. Instead, Anna is reduced to working as a servant at the village rectory and to taking in a border sent her way by Michael Mompellion, the rector. Unfortunately for everyone in Eyam, the new cloth that was brought into the village by this traveling London tailor was infected with the “seeds” of the plague that was soon to devastate the village. when “The Plague” was imported in infected cloth from London in 1665. 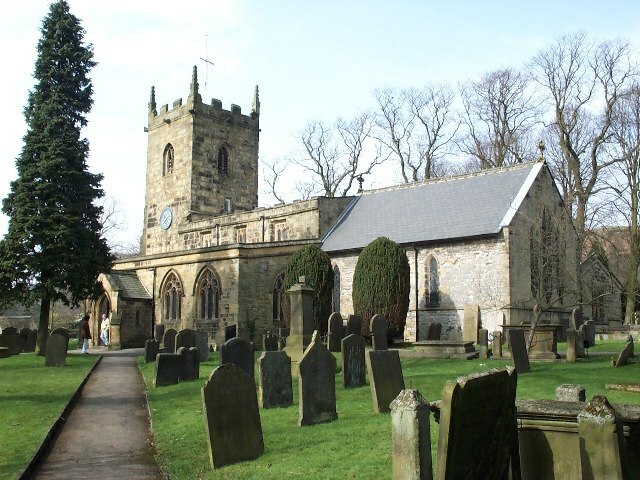 Eyam, a village of less than 400 citizens, had one church (see picture above) and Michael Mompellion (its rector) was depended upon for his leadership and moral guidance. He asked his congregation to close the village off, with no one allowed in or out until the plague had run its course. Reluctantly, the villagers agreed that it was the right thing to do. Little did anyone expect that two-thirds of those sitting in the church that day would not be alive one year later. The Year of Wonders is both a captivating and harrowing account of the bubonic plague, and its effect on a community as well as the people – rich and poor…child and adult…alike. It’s a fascinating look at what happens to a group of people who made the decision to cut themselves off from the rest of the world to await their fate. As more and more people die the painful death that comes with bubonic plague, some find a strength that they never knew they had while others become filled with doubt and all of the worst aspects of human nature. Eventually, Anna, and Michael and Elinor Mompellion provide the care and comfort that makes it possible for the village to honor the pledge that it made to protect its neighbors. Geraldine Brooks fills the Eyam/Plague Village with realistic human beings who, in barely twelve months, display all the best and worst that human beings have in their nature. The people she describes in Year of Wonders are no different than the people you might encounter the next time that you find yourself in a natural disaster that temporarily cuts your area off from the rest of the country. 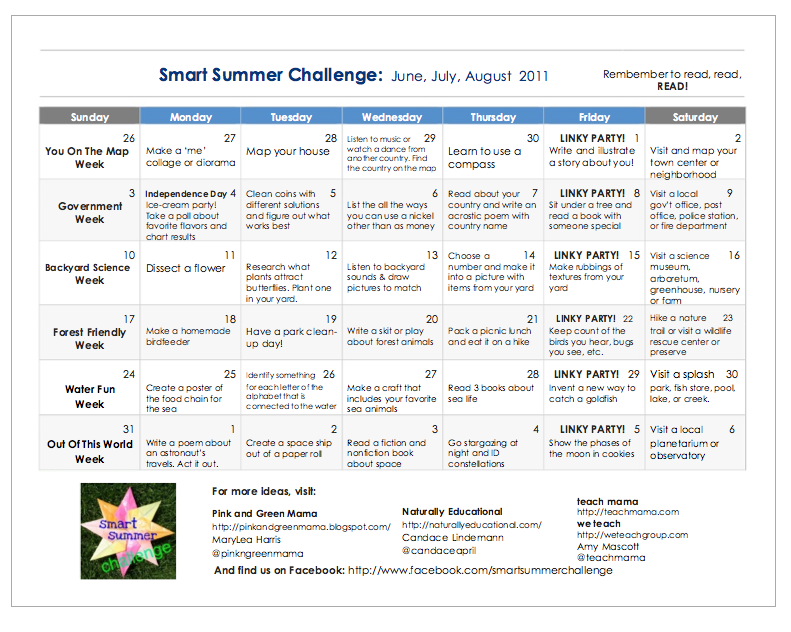 Every Friday starting on July 1st through the middle of August, there’s a Smart Summer Challenge going on at Pink and Green Mama, Naturally Educational, and Teach Mama. The goal is to do daily educational (yet fun) activities with your children. 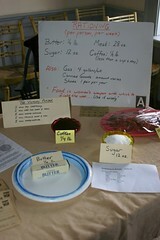 Sunday – Did 4-H projects for the county fair. Both the girls finished their embroidery projects – Olivia made an embroidered pillowcase and wall hanging; and Sophia made an embroidered stuffed dog. as well as flowers, leaves, and vines. At 8 and 10 years old respectively they’ve been doing embroidery for a few years now and enjoy it. Monday – Olivia learned to do papercutting with an exacto knife for one of her 4-H projects. This was a challenging project because the knife has to be held a certain way in order for it to cut properly. After cutting the image of the horse, she layered black and blue paper behind the cut-out sections to create the picture. This is the paper cutting that Olivia made. then punched holes with a paper punch along the top and bottom. then blue paper behind the entire picture. Sophia spent the majority of the day preparing food for her 4-H demonstration about using herbs in cooking/baking, medicines, and personal care products. Sophia doing a 4-H demonstration about herbs. chocolate chip mint cookies and iced mint tea. All the herbs used were from our garden. Both the girls did a demonstration in front of about a dozen people on Monday night. invited them to eat their first puzzle piece. Puzzle sandwich that Olivia and I made together. They will do the same demonstration at the County Fair on July 13th. We also visited two farms where 4-H members live. One had rabbits, horses, dogs, and cats. 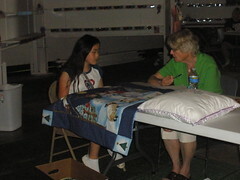 The 4-H member focused on sharing information about her rabbits and showing them at the fair. The girls listening to a presentation about rabbits. Rabbits are on their list of animals they’d love to have. The other place we visited was a dairy farm. The girls both learned a lot about raising and showing dairy cows; and now want to do the dairy project. Olivia is taking a look at a three-year old cow. They would start out with a spring calf to show next year (one that is born in March-May 2012; and show it in July 2012). about 100 or so pounds. Not the huge 1,500+ pound ones. Today’s map location: three different rural towns in Minnesota (including home). Olivia’s paper cutting projects has ties to China. More information about paper cutting is HERE. 4-H began in 1902 in Clark County, Ohio. 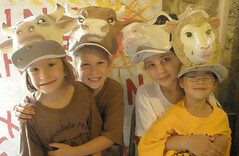 More information about 4-H is HERE. Tuesday – The girls enjoyed having two friends over. They introduced them to Bailey and Hoss (the pony and miniature horse), played a game, climbed trees, had a picnic in the fort, and searched for and found lots of frogs and toads. 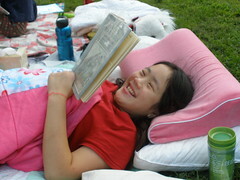 In the afternoon and evening, we spent time reading. 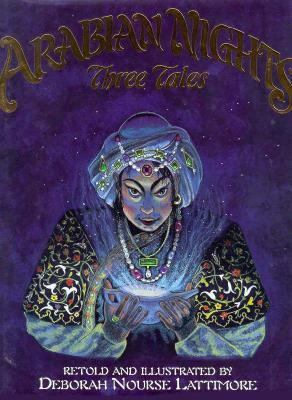 One of the books we read was Arabian Nights: Three Tales by Deborah Nourse Lattimore. Today’s map location: Today was spent at home. One of the stories we read takes place in ancient Cathay (known today as China). The other stories were set in fictional locations. Wednesday – We picked strawberries at a nearby patch and learned about strawberries. Sophia holding some strawberries that she picked. We also went to a buffalo farm and were so excited to see lots of young ones in the pasture. In the late afternoon, we had a backyard picnic while enjoying the sounds of nature. The strawberries and picnic tied into our on-going nature study that we do (we try to do at least one nature study per week using the Handbook of Nature Study). Having a picnic on the deck. Today’s map location: two small towns in Minnesota (one for the patch and picnic; and the other for the buffalo farm. In addition, we can add Brittany, France (where the garden strawberry was first bred) to the places we “visited” this week. The garden strawberry is a cross between two varieties – one from North America and the othe from Chili. The former is noted for its flavor while the latter was noted for its larger size. For the American bison (also known as the American buffalo), the location is North America. At one time, their range was roughly a triangle between the Great Bear Lake in Canada’s far northwest, south to the Mexican states of Durango and Nuevo León, and east along the western boundary of the Appalachian Mountains. Due to commercial hunting and slaughter in the 19th century, the bison nearly went extinct. Today, buffalo can be found in reserves, on farms, and a few national parks. Thursday – Sophia had a harp lesson in the morning; we went to the library to return some books and check out more books; and learned about Vietnam a bit in the afternoon. We are finishing up our multi-year around-the-world geography study. Sophia has in her geography book. We skipped ahead from U to W back when Prince William and Princess Catherine were married (since Prince William’s mother was from Wales)…and then continued on with X, Y, and Z (Mexico – since no countries in the world start with the letter X; Yemen; and Zambia). Realized we didn’t do V…so we began learning about Vietnam today. Today’s map location: two cities and one rural town in Minnesota for the harp lesson, library, and at-home study. We also learned about Vietnam today…so we “traveled” back to the east. Literature is written or spoken material that is the work of the creative imagination, including works of poetry, drama, fiction, and nonfiction. Through the current curriculum I’m using with the girls (Sonlight), we’ve been introduced to wonderful literary works in each of the genres mentioned. for the upcoming school year are received. reading or listening to during the upcoming year. In addition to using the books that are part of the Sonlight curriculum, I’m also using several lists of books to introduce the girls to a wide variety of literature (e.g., Newbery Medal, Caldecott Medal). – (John) Newbery Medal – honors the author of the most distinguished contribution to American literature for children. – (Randolph) Caldecott Medal – honors the artist of the most distinguished American picture book for children. – (Theodor Seuss) Geisel Medal – honors the author(s) and illustrator(s) of the most distinguished contribution to the body of American children’s literature known as beginning reader books published in the United States during the preceding year. – (Laura Ingalls) Wilder Award – honors an author or illustrator whose books, published in the United States, have made, over a period of years, a substantial and lasting contribution to literature for children. 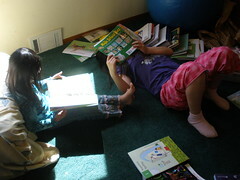 Reading is such an integral part of homeschooling for us. Since the girls were young, I have read to them daily. Once Sophia began reading on her own, she spent more time being able to read independently which expanded the number of books she listened to/read each day. The girls both listen to books on CD as well. 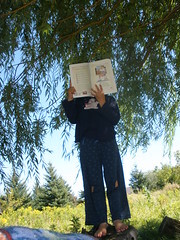 In addition to reading inside, the girls enjoy reading outside – on blankets on the ground with the clouds and trees as the backdrop…or in one of the climbing trees in the backyard. Sophia reading outside on an early-fall afternoon. Literature has introduced the girls to historical facts, given them insight into different cultures; and provides the inspiration to learn more about different times and traditions other than their own. Some of our favorite homeschool memories center around literature-based unit studies. The first series we did was the American Girl one that focuses on ten year old girls from a variety of ethnicities and time periods in the United States. We started with the Kaya series which was set in the 1700s with the Nez Perce and finished with the Julie series that was set in the 1970s and had a Chinese-American sub-theme (this was nice for the girls who are both Chinese-American). in the back part of the farm. The girls and I did crafts, cooked/baked food that tied into each series, and took field trips to places to bring alive what they were reading in the American Girl Series. and Victory Gardens when we did the Molly unit study. focused on WWII (when the Molly series took place). 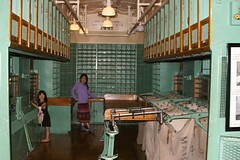 This display shows rations at the time (e.g., food, gasoline, shoes). The other series that we enjoyed was written by Laura Ingalls Wilder. Starting with Little House in the Big Woods and ending nine books later with The First Four Years, we not only read the books but did hands-on activities and took a trip to Pepin, Wisconsin (where Laura spent the early part of her childhood). We visited Pepin once when we started the series and were reading Little House in the Big Woods to see where Laura’s childhood home was located, saw the cemetary where some of the people mentioned in her book were buried, and visited a museum focused on the Ingalls family/Laura Ingalls Wilder. 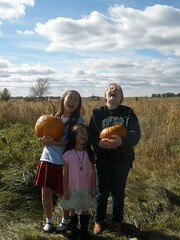 In 2010, we went back to Pepin with the girls’ grandparents; and stopped at the lake and went through town. 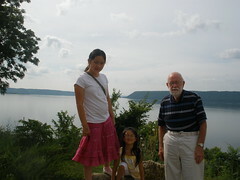 on the shores of Lake Pepin (Wisconsin). Children’s literature also has opened up the girls’ imagination and fostered an enthusiam for learning about things that they normally wouldn’t have thought or known. For example, I read to the girls a long time ago a book called Mailing May in which five-year-old Charlotte May Pierstorff begs to visit her grandmother, but her parents cannot afford to send her. In Idaho in 1914, the train is the only way to make the 75-mile trip over the mountains. The Pierstorffs come up with an unusual solution – mailing May. Sending her as a package is a third of the cost, and since her mother’s cousin Leonard handles the railroad mail car, she does not have to travel alone. So, we were on a trip up north a few years ago, and visited a train museum. There happened to be an old, restored mail car at the Duluth train museum. This brought to life this book which the girls clearly remembered and made the connection to; making the visit such a fun experience for the girls. Another way that literature has been a part of homeschooling is by sharing the gift of reading and quality books with others. We have donated many books to the local second-hand shop. All the proceeds from the sale of the books help fund programs that serve those in need in the community. The girls also donated some books to Books For Africa through the 52 Weeks of Giving program that we’re doing this year. And, perhaps, most meaningful (on a personal level) is seeing the gift of reading and literature shared between generations. One of my father’s favorite books that his mother read to him when he was a boy was The Story of Ferdinand. The story, written in 1936, is about a bull who would rather smell flowers than fight in bullfights. He sits in the middle of the bull ring failing to take heed of any of the provocations of the matador and others to fight. Sophia reading Papa one of his favorite childhood books. 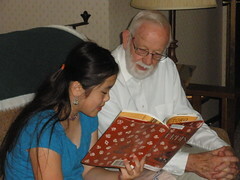 At the time (August 2010), he was able to still read the book. but enjoys being read to and listening. Literature has been and will continue to be an important and central focus of homeschooling for us.